Why does hot water clean better than cold water? I had a left over coffee cup this morning, and I tried to wash it out. I realized I always instinctively use hot water to clean things, as it seems to work better. A Google search showed that other people get similar results, but this Yahoo answer is a bit confusing in terms of hot water "exciting" dirt. What is the physical interaction between hot water and oil or a material burnt onto another vs cold water interaction? The other answers are correct, but I think that you might benefit from a more "microscopic" view of what is happening here. Whenever one substance (a solute) dissolves in another (a solvent), what happens on the molecular scale is that the solute molecules are surrounded by the solvent molecules. What causes that to happen? As @Chris described, there are two principles at work - thermodynamics, and kinetics. In plain terms, you could think of thermodynamics as an answer to the question "how much will dissolve if I wait for an infinite amount of time," whereas kinetics answers the question "how long do I have to wait before X amount dissolves." Both questions are not usually easy to answer on the macroscopic scale (our world), but they are both governed by two very easy to understand principles on the microscopic scale (the world of molecules): potential and kinetic energy. And then ask "Where is the rock going to go?" you have a pretty good idea: it's going to go to the lowest point (we are including friction here). On the microscopic scale, gravitational fields are extremely weak, but in their place we have electrostatic potential energy fields. These are similar in the sense that things try to move to get from high potential energy to lower potential energies, but with one key difference: you can have negative and positive charges, and when charges have the opposite sign they attract each other, and when they have the same sign, they repel each other. All molecules have some attractive potential energy between them, but the magnitude of that potential energy varies by a lot. For example, the force between the hydrogen atom on one water molecule ($H_2O$) and the oxygen atom on another water molecule is roughly 100 times stronger than the force between two oxygen molecules ($O_2$). This is because the charge difference on water molecules is much greater (about 100 times) than the charge difference on oxygen molecules. 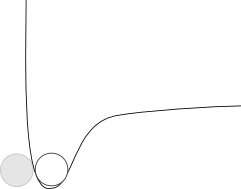 The "ghost" particle represents a stationary atom, and the line represents the potential energy "surface" that another atom would see. 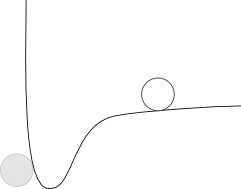 From this graph, hopefully you can see that the moving atom would tend to fall towards the stationary atom until it just touches it, at which point it would stop. Since all atoms have some attractive force between them, and only the magnitude varies, we can keep this picture in our minds and just change the depth of the potential energy "well" to make the forces stronger or weaker. Now if I ask "where is the rock going to go?," It's a little bit tougher to answer. The reason is that you can tell the rock is "trapped" in the first little valley. Intuitively, you probably can see that if it had some velocity, or some kinetic energy, it could escape the first valley and would wind up in the second. Thinking about it this way, you can also see that even in the first picture, it would need a little bit of kinetic energy to get moving. You can also see that if either rock has a lot of kinetic energy, it will actually go past the deeper valley and wind up somewhere past the right side of the image. What we can take away from this is that potential energy surfaces tell use where things want (I use the term very loosely) to go, while kinetic energy tells us whether they are able to get there. Now the atoms from before are at their lowest potential energy. In order for them to come apart, you will need to give them some kinetic energy. How do we give atoms kinetic energy? By increasing the temperature. Temperature is directly related to kinetic energy - as the temperature goes up, so does the average kinetic energy of every atom and molecule in a system. By now you might be able to guess how increasing the temperature of water helps it to clean more effectively, but let's look at some details to be sure. Going back to the coffee cup question, all we need to do now is think about how these will play out with the particular molecules you are looking at. Coffee is a mixture of lots of different stuff - oils, water-soluble compounds, burnt hydrocarbons (for an old coffee cup), etc. Each of these things has a different "stickiness." Oils are not very sticky at all - the attractive forces between them are fairly weak. Water-soluble compounds are very "sticky" - they attract each other strongly because they have large charges. Since water molecules also have large charges, this is what makes water-soluble compounds water-soluble - they stick to water easily. Burnt hydrocarbons are not very sticky, sort of like oils. Since molecules with large charges tend to stick to water molecules, we call them hydrophilic - meaning that they "love" water. Molecules that don't have large charges are called hydrophobic - they "fear" water. Although the name suggests they are repelled by water, it's important to know that there aren't actually any repelling forces between water and hydrophobic compounds - it's just that water likes itself so much, the hydrophobic compounds are excluded and wind up sticking to each other. Hydrophilic compounds dissolve quickly in water because they stick to water pretty well compared to how well they stick to each other and to the cup. In the case where they stick to each other or the cup better than water, the difference isn't huge, so it doesn't take much kinetic energy to get them into the water. So, warm water makes them dissolve more easily. Hydrophobic compounds (oils, burnt stuff, most stains) don't stick to the water. They stick to each other a little bit (remember that the forces are much weaker compared to water since the charges are very small), but water sticks to itself so well that the oils don't have a chance to get between the water molecules. We can scrub them, which will provide enough energy to knock them loose and allow the water to carry them away, but if we were to increase the kinetic energy as well by increasing the water temperature, we could overcome both the weaker forces holding the hydrophobic compounds together, while simultaneously giving the water molecules more mobility so they can move apart and let the hydrophobic compounds in. And so, warmer water makes it easier to wash away hydrophobic compounds as well. We can tie this back to the original thermodynamics vs. kinetics discussion. If you increase the temperature of the water, the answer to the question "How much will dissolve" is "more." (That was the thermodynamics part). The answer to "How long will it take" is "not as long" (kinetics). And as @anna said, there are other things you can do to make it even easier. Soap for example, is made of long chain molecules with one charged end and one uncharged end. This means one end is hydrophilic, while the other end is hydrophobic. When you add soap to the picture, the hydrophilic end goes into the water while the hydrophobic end tries to surround the oils and burnt stuff. The net result is little "bubbles" (called micelles) made up of soap molecules surrounding hydrophobic molecules that are in turn surrounded by water. First, I would be very skeptical of anecdotal claims here - there are all sorts of psychological biases that can influence the perceived outcome. That said, water is used to clean surfaces by way of carrying away large particles and dissolving small ones. In the case of carrying pieces of dirt away, any temperature will do. When it comes to dissolving, there are two relevant (and often conflated) concepts: thermodynamics and kinetics. By thermodynamics I mean how much material can be dissolved before the water becomes saturated. This matters if you leave something soaking in a small amount of water for a long time. If the water can't hold all the material you want it to dissolve away, then indeed it will leave some residue. Warmer water tends to dissolve slightly larger amounts of solids, but note this only applies if you keep the water warm throughout the soaking process. In practice, it's usually rather difficult to saturate water. The limiting process is more often kinetics - how fast materials dissolve in the water. If you picture water as a collection of particles, warmer water has faster moving particles, and so it should come as no surprise that these collide more frequently with the material needing to be dissolved, doing the job faster. If you've ever tried to dissolve solid sugar into iced tea, you've experienced how kinetics can make the process nearly interminably slow, even though thermodynamically the ice water can hold the sugar in solution. Just to throw a counter-example in here: there may be some cases where the opposite is true. Hot water can cause proteins to denature and coagulate (as in the case of egg white in boiling water), so you might do better to clean certain proteinaceous substances with colder water to avoid them coagulating and sticking to the side of the container. I'll give this as a partial answer, let's just call it the gross overview of the reasons. Hopefully somebody will come along and give a physics justification. If I get some extra time soon, I will try to expand it out. Part of it is that hot water melts oil/grease/etc while cold water would solidify it. So oily/greasy things will come off easier when hot than cold. It depends on the nature of the fat whether it is liquid or solid at room temperature or at the cold-water temperature, but the general trend is there. Also, hot water is a better solvent than cold water (which is why sugar is easier to mix into hot tea than cold). Hot water has the ability to store more dissolved solids than cold before it becomes saturated. So particulate matter will be carried away better by hot water than cold. Answering this question best requires defining the verb "clean", and the word "better" well. Some of the other answers are spectacular in getting into how hydrogen atoms have great attraction when bonded to oxygen in a water molecule and even how much gravitational forces compare on a micro or macro level, but none define the terms well enough to give a truly succinct answer, in my opinion. So I'll start with defining the important terms first, then the answer will be shorter, and probably less spectacular but maybe more useful. 1) Think of every molecule of water as a tiny janitor, with a tiny broom and a tiny waste basket. Now imagine that when his waste basket is full he is done for the day...he can accomplish no more work, period. 2) When The tiny janitor is at his coldest his broom and his wastebasket work differently than when he's at his hottest. 3) When he's at his coldest, his broom has very big bristles and smaller particles are missed by it...they don't get caught in the broom. Also, when he is at his coldest, his wastebasket won't stretch to fit very much waste either, so overall Mr. janitor is at his worst when he is cold. 4) When he is at his hottest however, Mr Janitors broom becomes capable of moving smaller and smaller particles with every push of his broom. More like a fine brush than a stiff broom, but his broom acts more quickly too, as if making many more passes to collect smaller particles in the same amount of time. Also, when he is at his hottest, his waste basket can stretch to fit much more waste inside itself. Together these 2 improvements in performance add up to a lot better cleaning overall. There are only a couple cases where this might not be true, or quite as true when cold water actually prevents the waste material from breaking into smaller and smaller pieces. The first is soap. Hot water definitely cuts grease better, but cold water cuts soap better. You can test this when you wash your hands and see for yourself that rinsing the soap off your hands happens much faster with cold water, because it doesn't allow the soap to thin out as much. The second might be (I'm not sure) with existing dirty water. Rinsing dirty water with clean cold water is more effective that using hot water for pretty much the same reason. It does not allow for an increase of busy little janitors thinning out the dirty water. An extreme example of this would be to ask yourself which is easier, to clean up a frozen chunk of dirty ice off your living-room floor before it melts, or after. The molecules of hot water have high kinetic energy than the cold water. So they diffuse with dust particles easily. Thus carrying away impurities with it, hot water is better than cleaning than cold water. I am a class 9 student. Our teacher explained us that the rate of diffusion increases with temperature. Hot water, by definition, has faster moving molecules than cold water. (The molecular speed translates into heat.) All other things being equal, faster moving molecules do a better job of cleaning than slower moving molecules (in "displacing" the dirt and transporting it away using water. Hot water has lesser surface tension compare to cold water, because as temperature increases surface tension decreases.With less surface tension it is easy for water molecules to penetrate inside the dirty clothes and to remove the dirt particles. Not the answer you're looking for? Browse other questions tagged everyday-life water temperature or ask your own question. Water and electricity? Hot or Cold? Exception to weight of hot vs cold water? Does ice made with hot water melt faster than ice made with cold water? Why is oil a better lubricant than water? Why does hot water freezes faster than normal water? Why does sugar dissolve faster in hot water compared to cold water? Why can I touch hot things longer with water on hands? why does cold water have Translucent visibility?